Flick Hit: Kingsman Review: A familiar spy story with a twist. Kingsman Review: A familiar spy story with a twist. If you weren't into 50 Shades of Grey, giving Kingsman a try isn't a bad idea. Kingsman is a spy movie like James Bond. The kills are more gruesome, but the movie in and of itself doesn't break the mold. James Bond references are throughout Kingsman if you listen closely, even though they aren't set in the same world. 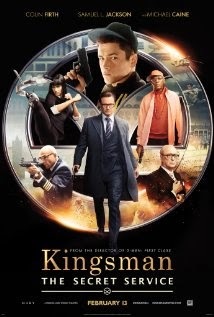 Kingsman follows a street kid named Eggsy (Taron Egerton) who becomes a spy to protect the world from evil. Taron Egerton is an actor from Wales and an up-and-coming star who will be making it big in the near future. Samuel L. Jackson plays an evil villain with a lisp whose name is Valentine. His role is pretty funny and can never really be taken seriously but he is accompanied by a woman with blades that can be really lethal. Michael Caine is the spy leader and works to ensure there is always a new spy in training to take the place of those who fall. Eggsy is taken into the organization under current agent Harry Hart (Colin Firth). Little does Eggsy know that Harry has a connection with him before all these tests take place and they form a bond of trust and friendship. Eggsy isn't alone in the spy tryouts and has to compete with others to reach the top. You might be surprised by the outcome. Valentine's evil plan is pretty good and not at all what you'd expect. If you have some sort of anger built inside of you it could be unleashed by something you carry with you every day. The final action scene is pretty intense and Valentine's plan only works with cooperation of the world's leaders. Give Kingsman a chance, especially if you got dragged to 50 Shades of Grey last weekend.